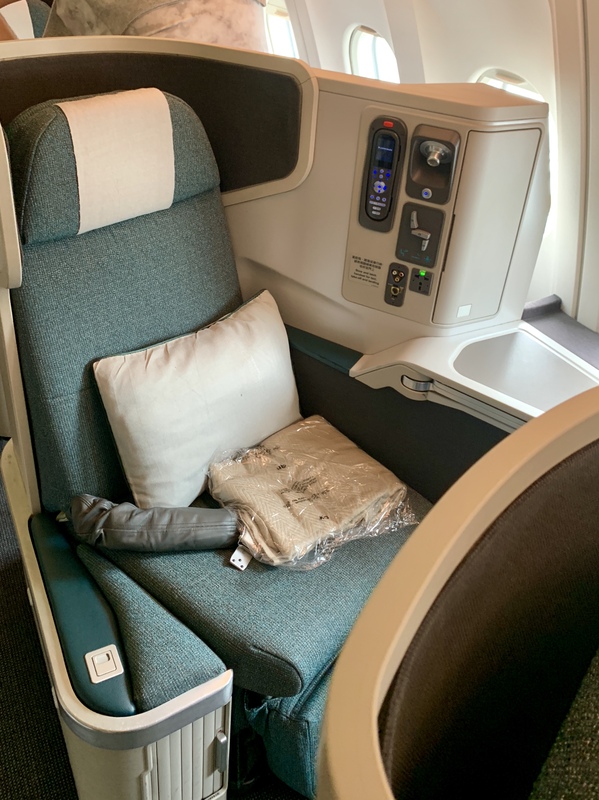 Although Roving Reporter and I were only flying short haul with Cathay Pacific these are the same seats as used on long haul so worthy of a review. 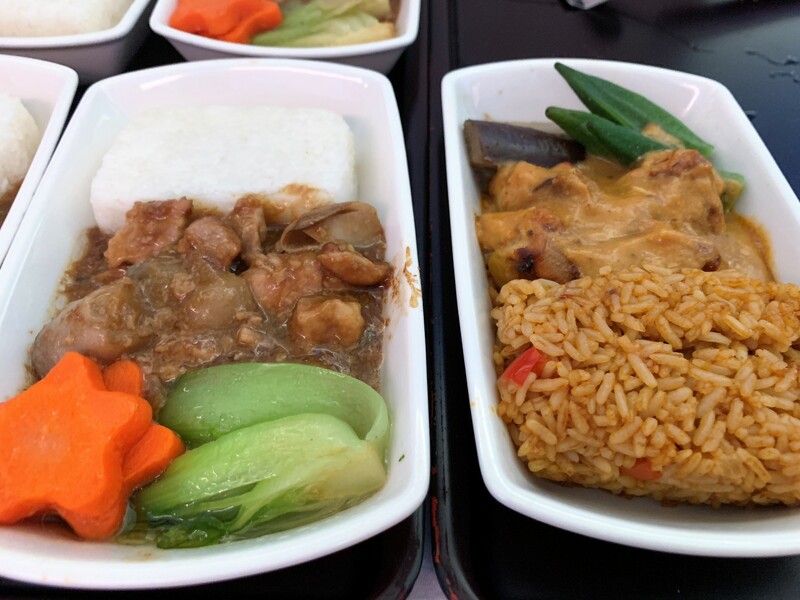 It is also interesting to see the contrast between what you generally get on short flights in European business class compared to what we received on Cathay Pacific. 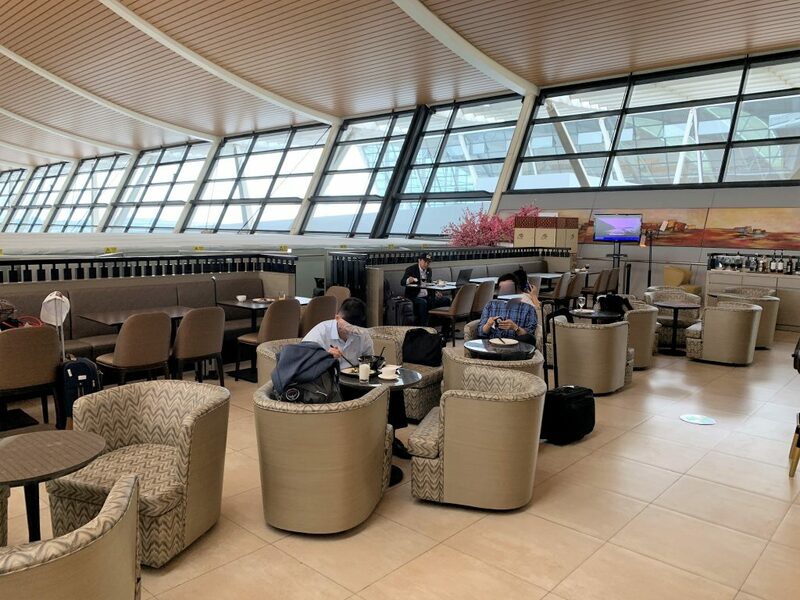 Roving Reporter and I were flying from Shanghai to Hong Kong for the second leg of our Asian trip which took in Shanghai, Hong Kong and finally ended up at the newly reopened Datai in Langkawi. Our journey did not start well with our transfers (which was a continuing theme on this trip ending with the world’s smallest chauffeur car in Hong Kong which nearly ended up with Roving Reporter being decapitated by the huge metal trolley piled up on top of our luggage next to his head!). Whilst the service we had from Blacklane was good, our car developed a fault on the way to the airport and we ended up limping along the motorway at about 10 miles an hour for the last part of the journey along with the odd complete breakdown. So I wasn’t in the best of moods when I arrived at the airport and it didn’t get much better! 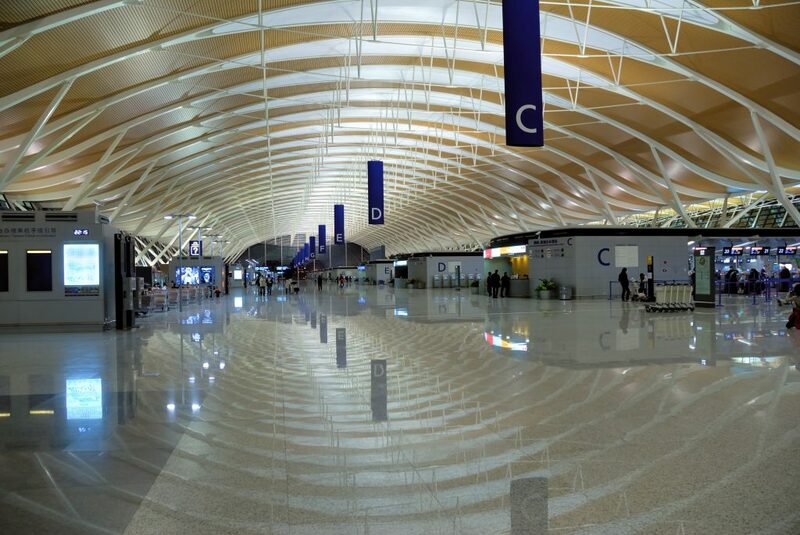 Shanghai airport was not my idea of fun. It took 50 minutes from arrival to when we got to the lounge and it wasn’t even that busy. There were so many layers of bureaucracy and queues it felt like an airport worker job creation scheme. First, you have to x-ray your luggage as you enter the airport. Then you proceed to check-in. As both Roving Reporter and I are Gold BA cardholders we used the First Class check-in desk. The First check-in area was just the standard lanes but the agent was helpful and spoke good English. He told me that I had to proceed to the luggage screening area and could not issue my boarding pass until I had my suitcase cleared. I waited and waited as various people tried to push in resulting in an argument between two passengers. Eventually it was my turn to proceed into the small room and unlock my suitcase so they could find what they were looking for. Unfortunately, my suitcase was singled out by security due to my Lugloc luggage tracker. Despite the fact that it has a tiny battery in it that is allowed by every airline and airport in the world that I have flown through I was made to remove it from my case. I was finally able to collect my boarding pass. After this, we went through Chinese customs and had to x-ray the hand luggage for the second time. We then faced a very long queue for immigration as there were only a few desks open. Then followed security where you had to take all battery packs out, even tiny phone chargers. I don’t understand the obsession in China with batteries compared to everywhere else? There was hot and cold food but none of it was particularly nice. The noodles were cold, dry and tasted of pretty much nothing. 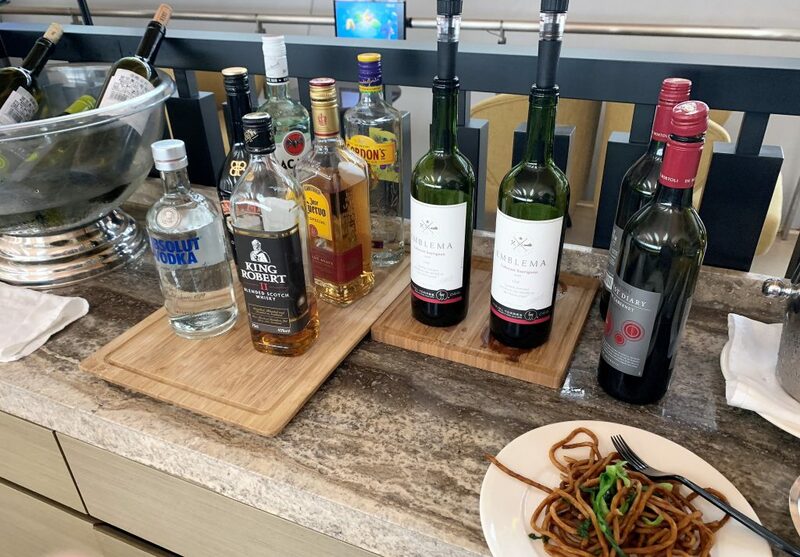 Drinks selection and some rather unpleasant noodles! 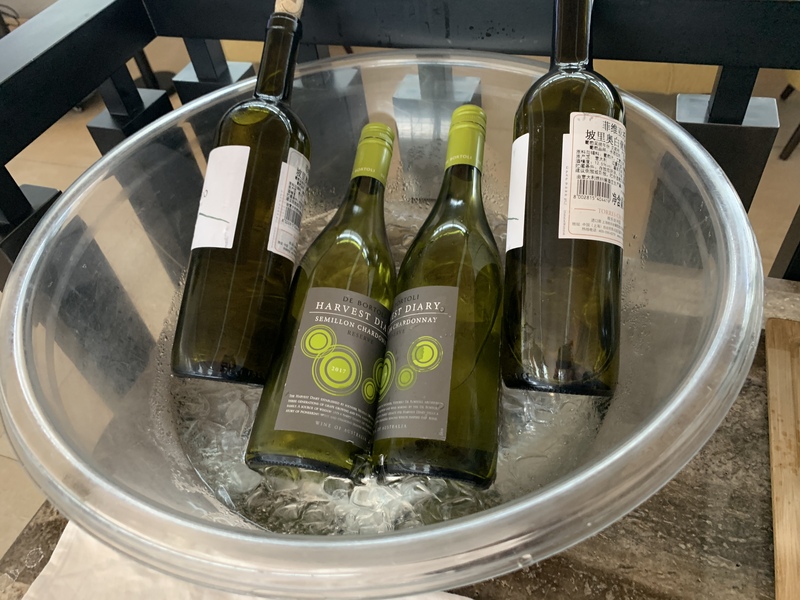 There was no sparkling wine but there was a choice of red and white wines as well as spirits and beers. If you wanted to work there were plenty of charging points and desks. We arrived at the gate around 35 minutes before departure and boarding had just started. 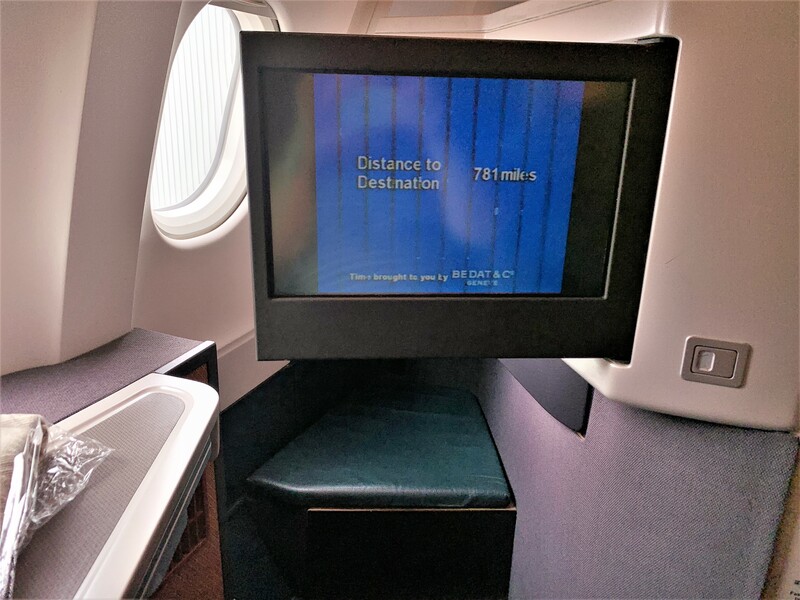 We used the Oneworld Emerald lane and didn’t have to wait at all. I received a warm welcome on board and was directed to my seat. My coat was hung up for me and a choice of water, juice or champagne was offered. Shortly afterwards I was given a hot towel. Then I was greeted by name and handed a menu. Finally, the CSM came up to welcome me back on board as Emerald and introduce herself. She let me know that we would be arriving early into Hong Kong provided there was no holding. She was charming and professional like the rest of the crew. 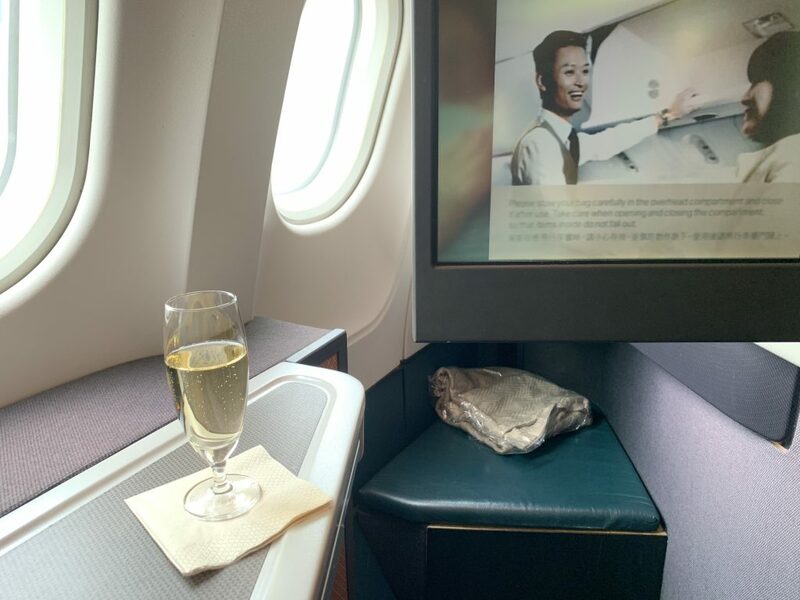 I was impressed that I was offered a top-up of champagne for this short 2-hour flight before we took off. 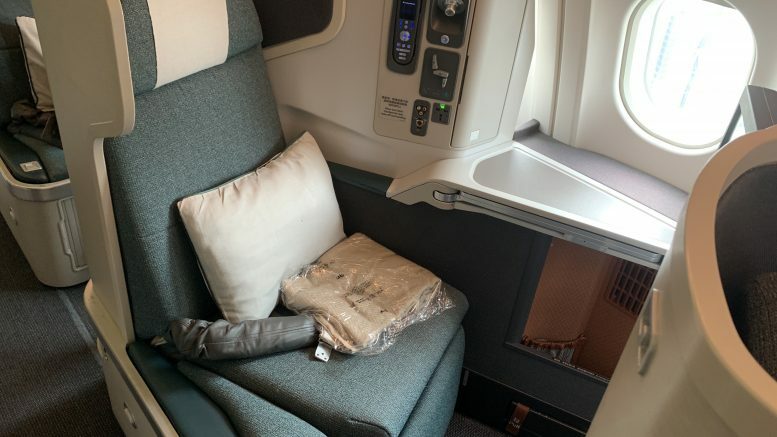 The seats on the flight were the same reverse herringbone seats used on Cathay’s long-haul flights. 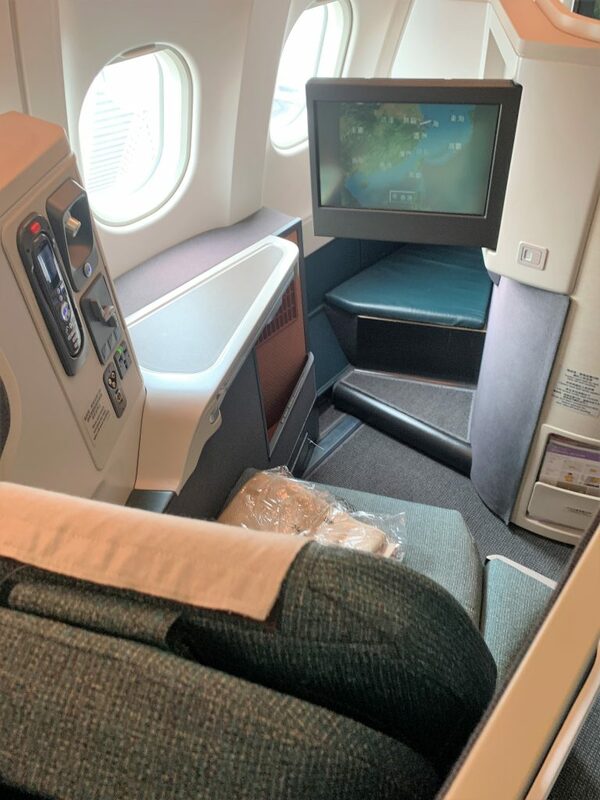 The seats were in a 1-2-1 configuration in the standard jade green Cathay fabric. The cabin didn’t really have much of a wow factor and was beginning to look a little old-fashioned now in areas. I was seated in 12A, a window seat, with RR behind me in 14A. 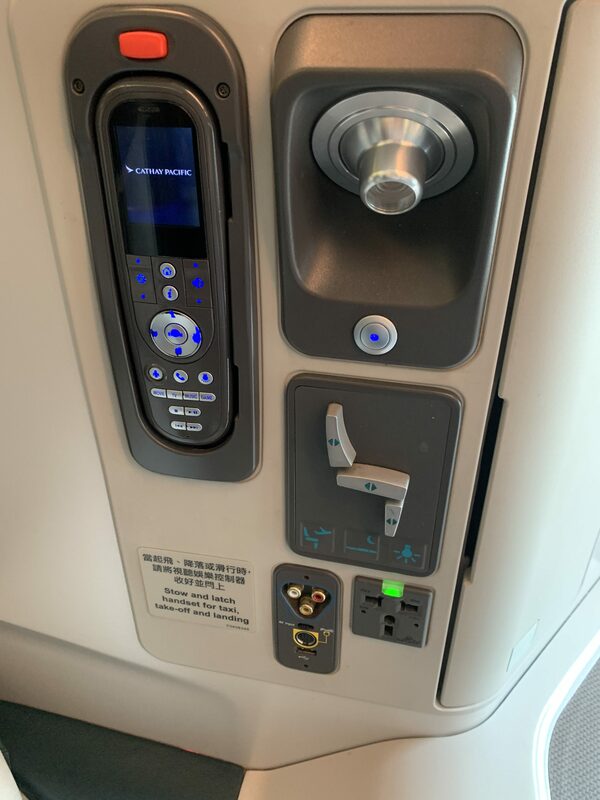 I didn’t find the seat as comfortable as some herringbone style seats as I couldn’t reach the footrest without reclining my seat substantially or not being able to use the table so I had to sit with my feet dangling off the end. 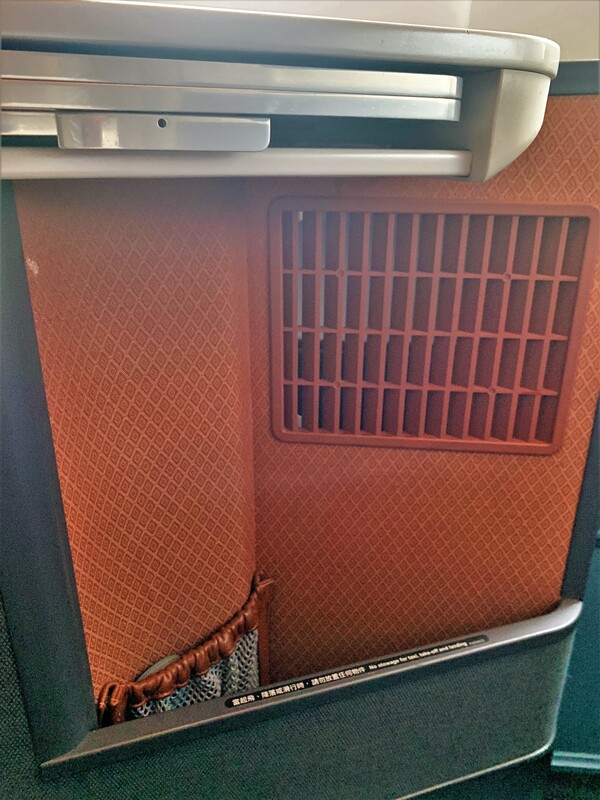 However, when the seat was fully flat it is comfortable although not relevant on a short flight like this. The table was fairly large and stable but you couldn’t move it backwards and forwards which was annoying – it just could be swiveled towards the side. Seat controls were fairly basic with footrest, recline and forward/back options. There was some storage with a side storage area with a small net pocket that would store most of your inflight essentials. However, as usual you couldn’t use it for take-off or landing. There was also a floor level locker which would be ideal for shoes. The table – note my feet dangling off the end of the footrest! A pillow and blanket were supplied as well. The blanket was rather odd – very thin and a bit scratchy. 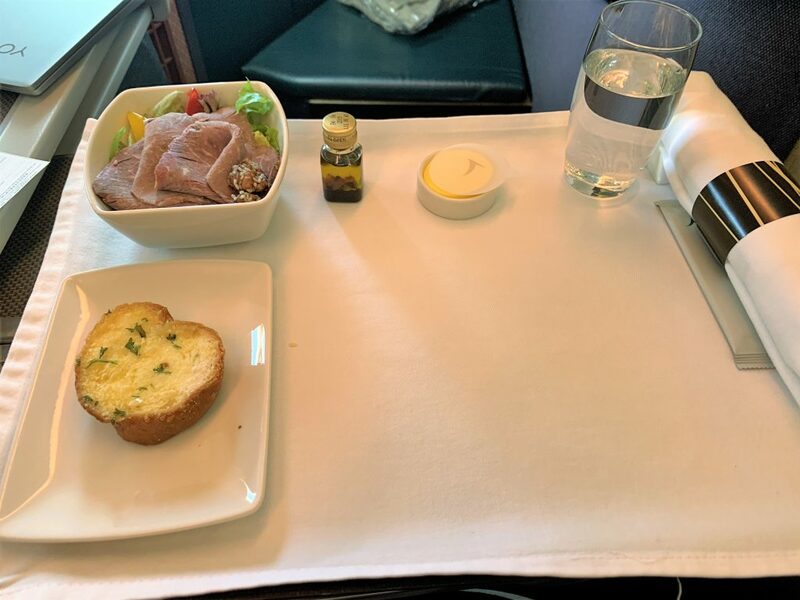 There was an impressive choice of food and drink for such a short flight. Prior to the meal, we were offered a drink from the trolley. 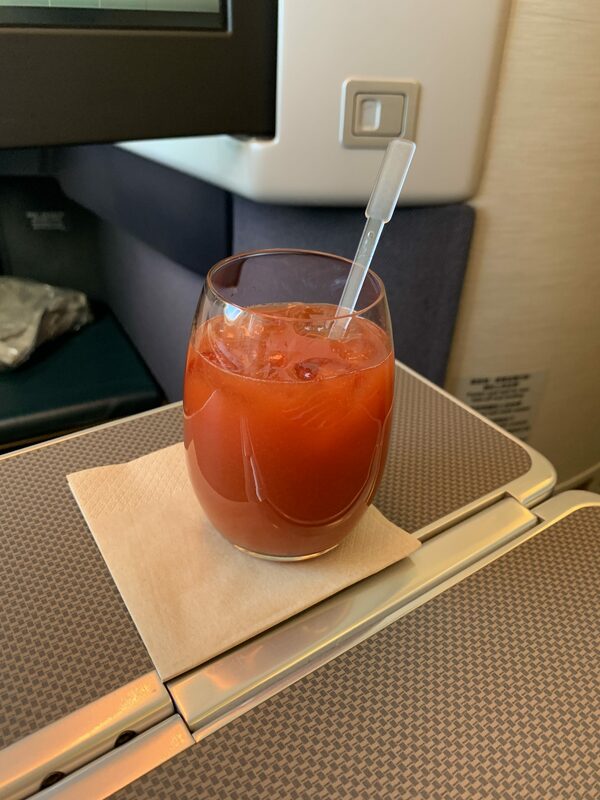 Both RR and I choose a Bloody Mary which had to be made in the galley. It was a pretty good one that tasted as if it was made with a pre-made mix. Then the table was laid up with a smart white tablecloth and the starter delivered. The starter was a little odd being a beef salad. This was literally cold beef on top of a mixed salad with a balsamic dressing. The beef was very tasteless so I left most of mine and just ate the salad which was fine. One of the things I love about flying in Asia is the garlic bread. Even though it is like cheap supermarket garlic bread it always feels like a treat on board a plane. Both RR and I were given just one small slice of garlic bread and sadly they did not come round with a second offering much to our disgust! The main courses were a lot better and all it was nice being able to see them all on the trolley and have each dish pointed out. I had the seafood with a cream sauce. 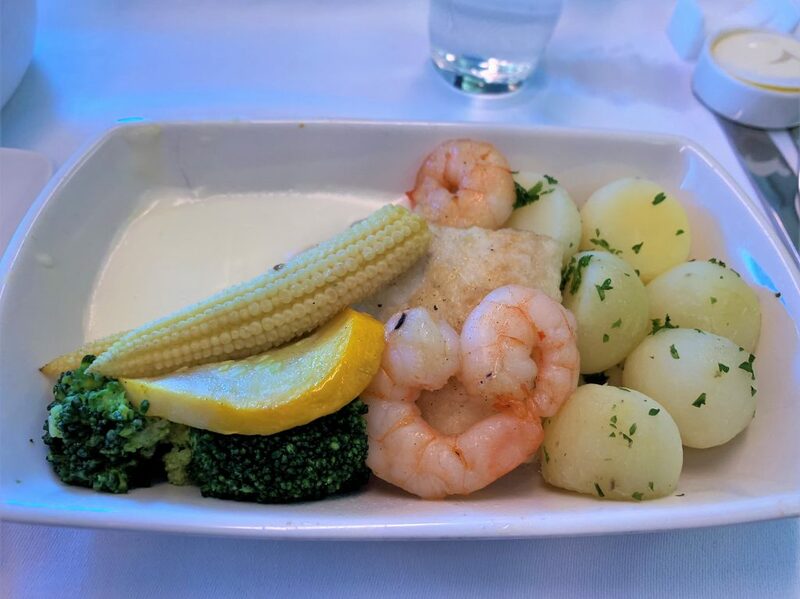 The seafood was very tasty and although the sauce was a little bland. 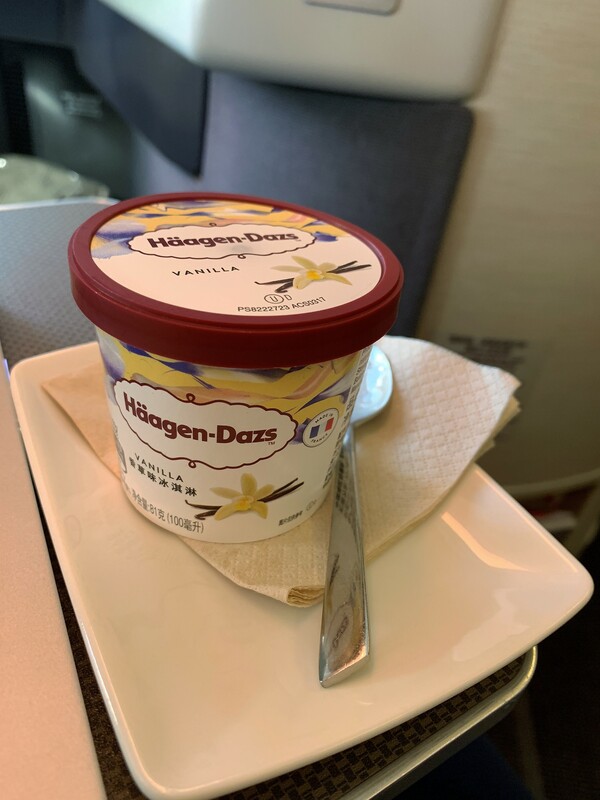 Cathay don’t really do dessert but as usual, there was a choice of 3 or 4 different Hagen Daaz ice cream flavours. Finally, tea and coffee were offered. The crew were all excellent, friendly and generally efficient although RR did have trouble trying to get a herbal tea after lunch as the cabin crew seemed to be suffering from amnesia and it took 3 attempts before the tea eventually arrived! There was no Wi-Fi on this flight although there was entertainment. The flip out TV screen did not have great definition and the handheld remote was quite old fashioned too. There was, however, a really good selection of recent films plus quite a few classics. I didn’t watch anything as I was working but Roving Reporter enjoyed the oddly titled “The Guernsey Literary and Potato Peeling Pie Society” film. There was also lots of TV programs and music plus games. The entertainment was available gate to gate pretty much although it did mean you had to watch it at an angle when the screen was stowed to the side. For charging there was a multi-plug socket, USB, AV and iPod sockets. 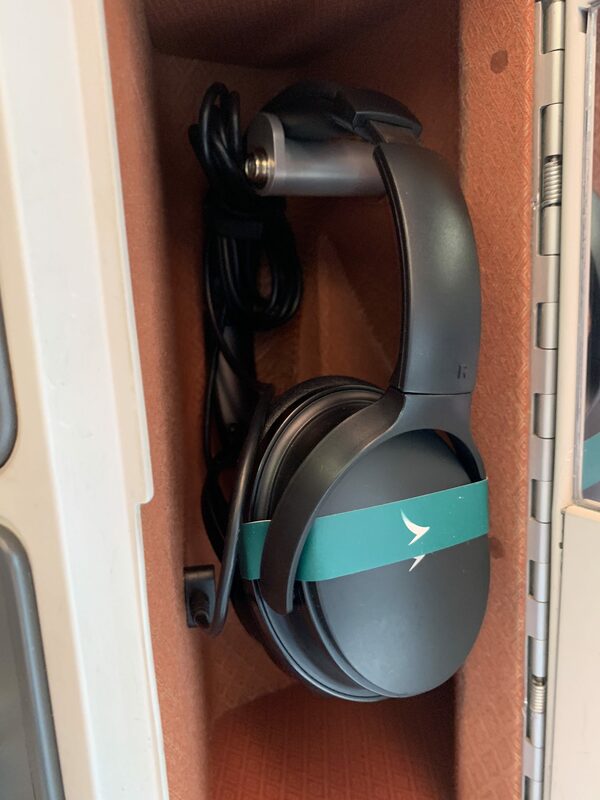 Noise cancelling headphones were supplied in their own cupboard which also had a handy mirror in the door. For such a short flight this was a very impressive flight. 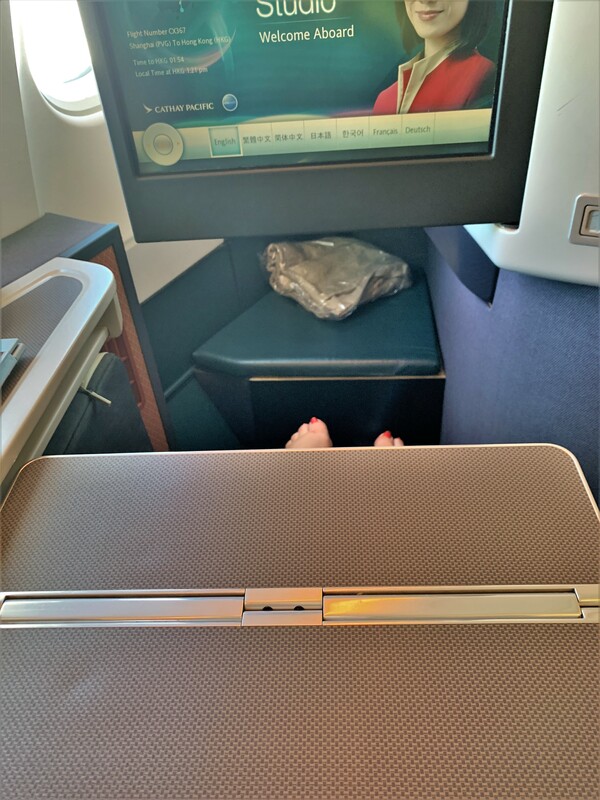 It felt like it was worth the extra to get business class when you get a full meal, good wines and a long haul seat. The crew were excellent and really you can only wish short-haul flights in Europe were like this! 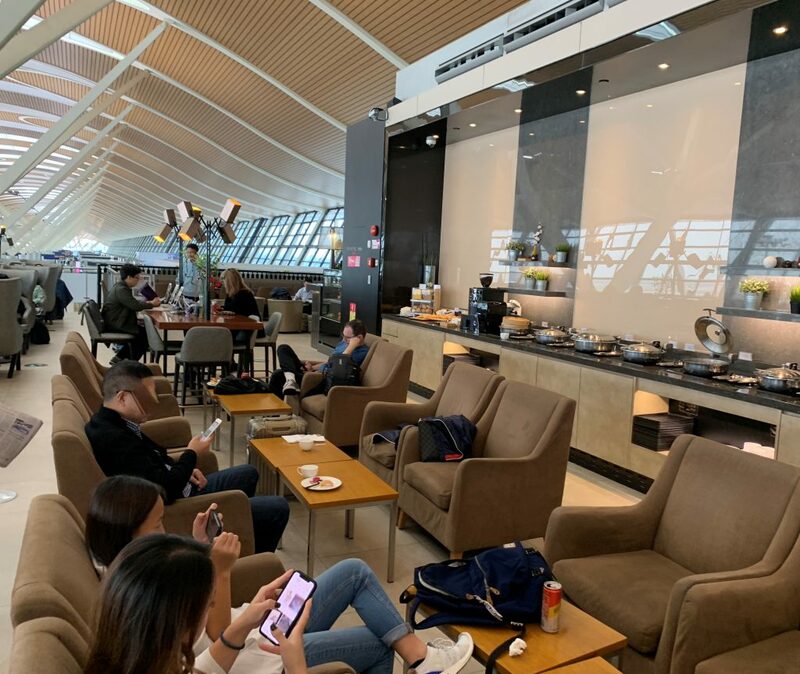 We paid for our flights using Avios and had flown out to Asia using our 2-4-1 British Airways Amex voucher to fly in First to Shanghai. Reviews of the BA flights will follow shortly. 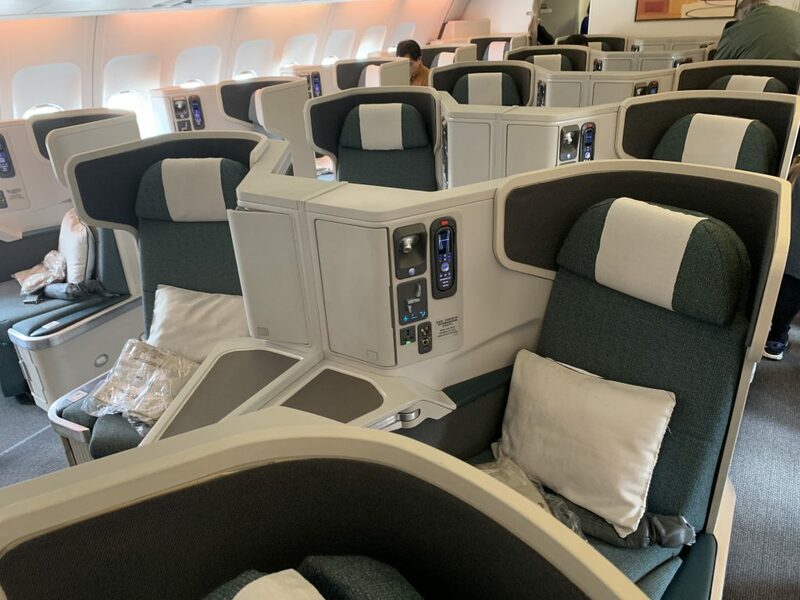 2 Comments on "Cathay Pacific A330 Business class review in 360°"
Can I ask where you purchased your Luglok ? I got mine on Amazon but it is currently out of stock. The new model has just come out and I will be reviewing this in a couple of weeks time.